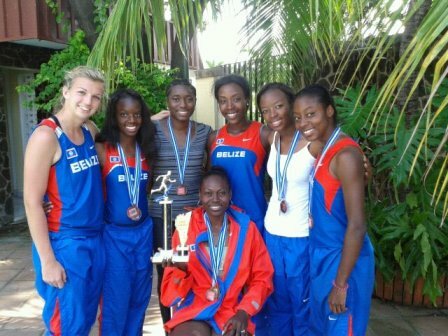 While the Swifts have done well in representing Belize regionally, additional Belizean athletes living abroad have also been recruited to compete on the world stage. Altogether, a team of fifteen athletes, including Kathy Sealy and Kenneth Medwood who reside in the United Kingdom and the United States, as well as homegrown phenom Kaina Martinez will be participating in the London Olympics this summer. Martinez, says Gray, is currently away training. Medwood, on the other hand, has already qualified for London 2012. All these pple are born n raised abroad, no real Belizean is in this bunch, WTF? It’s a great achievement and honour to earn the right to represent your country like this. Congratulations and best wishes to all these athletes and the people who trained and supported them. Do these people incharge of sending a contingent even do local trials in the districts to find find locals. Its a pity this method still continues. i dont expect anything from these team but good for them. They get to go to London atleast. @JUNITO AND GHOST TOWN sad fi hear sum ah di comments weh people di mek be glad some ah di athletes dem fah abroad nuh forget deh country. be glad deh gwen guh represent belize and support yuh people. dah neva fi he fault he left belize ih mi dah wah lil boi but ih nuh figet weh he cuh from.he had wah betta chance ah show casing ih talent out yah. well anyways.good luck to all ah di athletes them representing belize in the olympics. MAY ALLAH BLESS U ALL.